In﻿﻿frared crystal bio mats are negative ion and infrared heat ray treatment systems that emit negative ions (Source). They are basically a combination of crystal, negative ion, and infrared healing (Source). How crystal healing works: proponents of crystal healing believe that the crystals are conduits for healing that enable positive, healing energy to flow into the body with negative, disease-producing energy flowing out (Source). The philosophy of modern crystal healing is predicated on traditional medical concepts borrowed from Eastern cultures. Particularity the Chinese notion of life-energy (qi or chi) and the Buddhist or Hindu concept of chakras, which are vortices of this life-energy, said to connect the physical and supernatural elements of the body (Source). One buyer that we interviewed who purchased the MediCrystal mat said that they began by using using it three days a week, gradually upping the temperature, allowing it to preheat for 20 minutes before laying down on it. This reviewer was a little bit surprised at how heavy it was (it does ship in 3 different sizes, however)- the 19-pound weight can be attributed to the amethyst stones. Immediately, she noticed a greater ability to breathe clearly, saying that her sinus issues were temporarily alleviated. 17 layers of untreated purple amethyst crystals. Includes: The mat, a controller, a protective cover pad, storage handbag and instructions. She also recommends that as you lay on it, you can do some basic back stretches. While she purchased this MediCrystal amethyst mat to help pull toxins from her system, being a novice user, she can't say whether it has worked for that yet, but she does say that she feels a greater energy in her day-to-day life. Besides, you can always return it if it doesn't work for you. How Far Infrared therapy (FIR) works: the mats gently elevate your body's surface temperature to 107.6 Fahrenheit (42 Celsius) and above, which positively activates your body systems and functions. When the infrared mat induces a small temperature increase in the body, it actually enhances your body’s functioning on a variety of levels. These invisible energy waves will penetrate all layers of your body, reaching into the inner-most areas of your tissues, bone and muscle. Radiant infrared heat will actually heat you up directly, rather than just warming the air around you like a conventional heating pad would does. Its proponents claim that far infrared heat (otherwise known as radiant heat) helps to alleviate pain more effectively than less absorbent, topical heat, helping to heal, soothe, detox and stimulate your body, as well as your mind (Source). Amethyst Crystals: its proponents claim that it possesses healing powers to help people with general medical conditions, emotional issues, as well as in energy healing and Chakra balancing. Amethyst crystal therapy is largely used for physical ailments of the nervous system, treating nightmares and sleeping disorders, and managing the crown Chakra. Jade Crystals: crystal-healing practitioners say that Jade represents serenity, purity, and knowledge obtained by tranquility. It heightens love and nurturing. On a physical level, Jade crystals can help aid your body’s filtration and elimination organs. It is great for the treatment of kidney problems and the adrenal glands. Jade can help to remove toxins, rebind skeletal and cellular systems, and heal stitches. Tourmaline Crystals: crystal healers claim that Tourmaline helps with knowing oneself as well as others. It encourages self-confidence and reduces fear. Tourmaline draws in to you feelings of motivation, empathy, patience and affluence. It levels out the right-left sides of the human brain, assists treating paranoia, claims to alleviate dyslexia and enhance hand-eye coordination. Tourmaline releases stress, which makes it ideal for spinal adjustments. It stabilizes male-female energy within your body, boosting energy and gets ridding your body of blockages. This mini amethyst mat offered by MediCrystal is efficient, relaxing and easy to program. Users love the multilayer waterproof cover, but some do note that this is an expensive heating pad. This compact amethyst mat has a size of 32” x 20”, a thick layer of natural amethyst crystals, a digital controller, a power input of 110-120V, a user guide, and a storage bag. You can set and maintain heating temperate from 86°-158°F, and set a session time from one to nine hours. This bio-mat also emits negative ions, concentrates infrared rays deep into the body, and it’s EMF free, so it’s an excellent choice for anyone with chronic pain. In general, users are extremely satisfied with this mini amethyst pad, and they praise its effectiveness and usefulness. 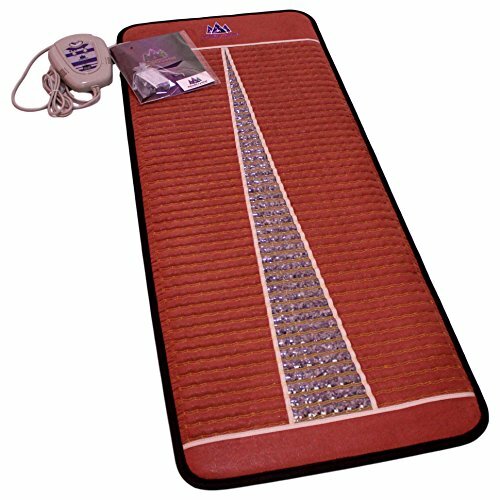 A customer shared that she has suffered from back pain for almost 20 years and that her pain lessened after she started using this infrared amethyst mat daily. Now, she is feeling more relaxed and less stressed than before. The reviewer also states that the customer service is exceptional and they promptly send her a new remote control after hers broke. Another user mentions that it’s easy to set-up this amethyst bio mat and that it produces a significant amount of heat. The purchaser also says that she feels full of energy only after 20 minutes of use. She highly recommends it to anyone who wants a high-quality amethyst heating pad. This far infrared heating pad offered by MediCrystal is practical, convenient and comfortable. Users love that it’s easy to adjust the temperature, but some do you can’t use it in an unlimited mode. This midsize amethyst bio mat has a size of 59 x 24 inches, a heating surface of 48 x 23 inches, a thick layer of natural amethyst crystals, a protective cover pad, an overheat protection, a digital controller, storage bag, and a power input of 110/120V. You can adjust the temperature from 86°-158°F, and choose a session time – 3, 6 or 8 hours, so this could be perfect for anyone who wants to try the infrared mat therapy for the first time. Overall, users have a high opinion regarding the MediCrystal far infrared amethyst mat, and they don’t have any complaints regarding its performance and design. A buyer comments that the warmth that comes from the amethyst gems is gentle, relaxing and comforting. The reviewer also states that this far infrared mat is perfect for long mediation and that the controller is well-built and easy to operate. Another satisfied customer shares that this amethyst pad is nicely stitched, well-made and effective – her back no longer bothers her since she started using the mat. A happy purchaser also mentions that she can sleep comfortably on the mat, even though it’s full of crystals and that she feels amazing. The reviewer also states that she achieved remarkable detoxing results and she would recommend it to anyone looking for the best amethyst mat. 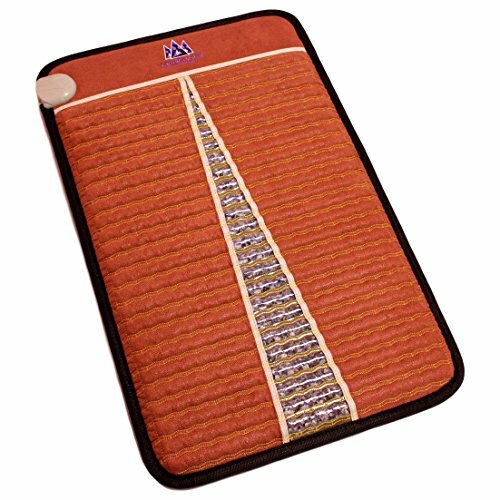 If you are looking for the best far infrared amethyst mat, you might want to consider this compact bio-mat offered by Ereada. Users love the comfortable surface, but some do note that it’s made in Korea. This mat is full of 20 pounds of the most expensive Korean amethysts, and it has a size of 24” x 59” inches, 15 layers, seven heating levels (68-158F), double silicon EFM free Titanium heating system, a digital controller, a protection cover and one year warranty. You can use it to improve circulation, detoxicated, lose weight or to relieve pain and stress. Overall, users are extremely satisfied with the Ereada far infrared amethyst pad, and they praise its design, functionality, and durability. 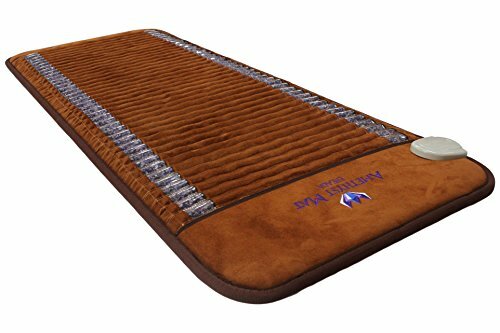 A happy buyer shares that the amethyst heating bio-mat arrived quickly and in perfect condition and that his wife’s joint pain has lessened since she started using the pad. Another purchaser comments that he is not very convinced of the amethyst bio mat benefits, but he likes the heat, and he sleeps better after a session. A happy user also states that she is immensely satisfied with the quality of this thick infrared mat and that the customer support answered all her questions. She highly recommends it. However, some customers note that if you live outside the USA, you’ll need an electricity transformer since the mat is customized for 110/120 V input. This far infrared bio-mat offered by Healthy Line is well-made, effective and so light that you can take it with you when you travel. Users love the custom designed carrying case, but some do note that there is no session timer. This professional bio heating pad is filled with the finest amethyst, jade, and tourmaline stones, and it has a size of 72”x24”, several thick layers, a weight of 18 pounds, adjustable temperature settings, a LED remote control, and one year warranty. Overall, this is an excellent choice for people interested in negative ion therapy, and it’s manufactured in the USA. A customer shares that she has lost around 3 pounds since she started using the Healthy Line professional heating pad and that she feels full of energy and more relaxed than usual. Another buyer comments that this infrared mat is made of high-quality material and that the stitching is durable and professional. A satisfied user also shares that this infrared mat is better and more efficient than a regular heating pad and that she feels warm and comfortable when she rests on it. The reviewer adds that she started to experience the benefits of the infrared heating mat quickly and that her joints and muscle no longer bother her. However, one customer has complained that the surface of the pad is harder than she expected and she advises that you cover it with a soft blanket. 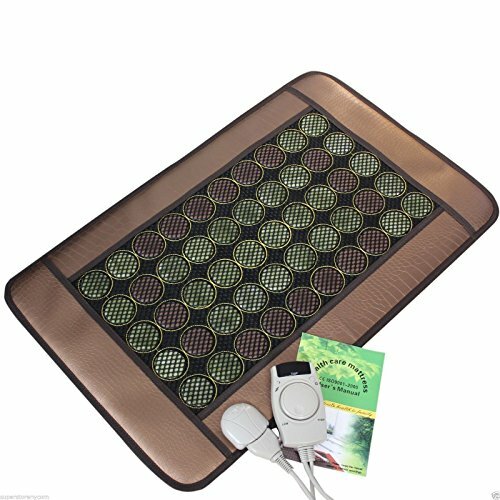 If you are looking for an inexpensive infrared heating pad, you might take a look at this natural jade & tourmaline bio-mat offered by HealthyLine. Users love the adjustable temperature setting, but some do note that they had problems with the remote control. This healing mat has a size of 32” x 20”, a weight of 7 lbs, and it’s composed of 14 to 20 layers of quality material, each with a unique function. It’s filled with jade and tourmaline stones that produce the highest level of negative ions (over 700 in jade, over 1500 in tourmaline) and it comes with a custom designed carrying case and a LED remote control. In general, users have a favorable opinion of this infrared bio-mat, and they praise its performance and usefulness. A buyer shares that she sleeps through the night comfortably since she got this heating bio mat. At first, she was skeptical of the possible benefits of using bio-mats, but she feels less pain and discomfort than before. She would gladly recommend the HealthyLine healing mat to anyone who wants to try the negative ions therapy. Another satisfied customer mentions that she uses this infrared pad regularly and the only thing she regrets is not buying it sooner. However, some customers have complained that the remote control stopped working after a couple of days and one user also notes that her mat contained only jade stones. 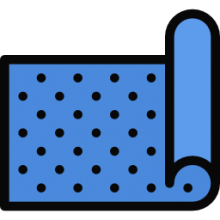 The MediCrystal manufacturers say that their negative-ion therapy mat is designed with a waterproof multilayer engineered for use during extended sessions, or even sleeping on. The negative ion therapy pad does come with an antibacterial cover- a handy inclusion. Another buyer described purchasing several different mats, saying that his other ones are made from jade and tourmaline. He told us that the amethyst provides a subtle and soothing feeling, with the warm stones generating a relaxing space for extended periods of meditation. Another buyer told us that he considered the amethyst healing mat well-constructed, with quality materials and stitching. While he concurs that it is a bit heavy, he wasn't dissatisfied with that, rather he felt that it testified to its solid and durable quality. Because he suffers from a work-related back injury, and frequently experiences sciatic flareups, he purchased this amethyst heating pad in the hopes of experiencing pain relief that his physical therapy sessions haven't been able to provide. After several sessions, he reports a moderate decrease in pain, improved posture and a healthier walking gait. This particular mat is powered by Amethyst crystals. Amethyst is a renown power crystal that possesses superlative healing powers, healers claim. As a healing stone it is characterized as purifying, pacifying, with significant calming qualities. It is used to treat and heal the central nervous system. Amethyst healing is practiced on a metaphysical level. The belief is that because amethyst crystals have absorbed the power of the earth's energies they have inherited vital healing powers for many types of ailments. The healing powers of Amethyst date as far back as the Greeks who believed Amethyst protected a person from the intoxicating effects of alcohol and into ancient Egypt as well. Is Amethyst Crystal Healing Safe? Yet another reviewer recommended using the crystal-healing mat like a sauna, saying that they wear a sheet over themselves as they lie on it to capture and retain the heat from the Amethyst stones. She feels that this maximizes the efficacy of the crystal healing by causing the hands, forearms, legs, wrist and neck to freely perspire. Its manufacturers have indicated that this ion therapy pad can be used to treat excessive weight gain, joint pain, muscle pain, issues related to over training, sprains and strains. The Ereada Bio Amethyst Mat was another solid option- the manufacturers say that it is made with 15 layers of Korean Amethyst, 20 pounds of these gems in total. It is indicated for the use of body detoxification, weight control, combating general sicknesses, and aiding the relief of stress and pain. One buyer that we spoke with was impressed by the cover that was included- it keeps the pad in good working order. They also told us that, surprisingly, the family dog has begun using it. Normally a stressed-out animal, he finds the infrared heating mat to be a restful and comfortable place to relax- probably benefited by the soothing powers of the amethyst crystals. Another reviewer, who was initially skeptical, wondering whether these devices are scams, or whether crystal healing actually works, says that she has experienced improved sleep quality since using the pad. To novice users, she says that be forewarned that the infrared healing pad itself without the cover is not soft- which makes sense because it is packed full of high-quality Amethyst stones. Another buyer we spoke with was a chronic pain sufferer, saying that their legs and hips had suffered dreadfully. She began using it at the highest heat setting, laying on it for 20 minutes, and says that almost immediately her afternoon migraine had evaporated. Over the course of more extended treatments, she discovered that the shoulder and neck pressure point pains she had been experiencing for years had suddenly disappeared. Indeed, she was so tremendously impressed by the reduction in pain, that she resumed her bicycle training- she says that she is able to take 30-mile trips without experiencing the debilitating and imprisoning pain in her legs and feet. 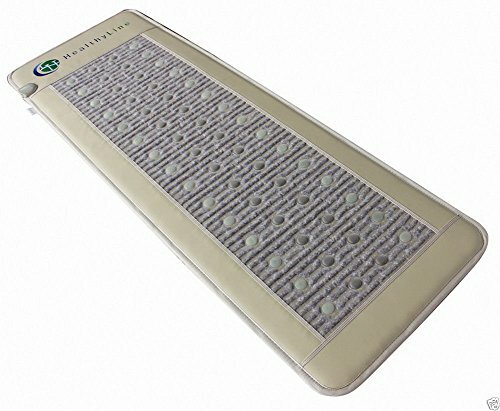 One buyer who was recovering from a surgery purchased this bio-healing mat to use the infrared heat to provide soothing healing to her operation areas. Another reviewer endorses the healing properties of this infrared crystal pad, saying that their normally stiff and achy muscles have almost magically healed after several sessions on it. The HealthyLine FIR pad was another option that we examined- the manufacturers say that the deep-penetrating FIR heat goes 4 inches to 6 inches into your body, helping to decrease the experience of pain in muscles, joints and bones. As well, they say that the negative ion therapy promises to help boost cellular function detoxification, helping to reduce acidity and heal users from computer and smart phone radiation. One buyer that we spoke to about this FIR crystal mat said that it is hard, and heavy, but they have experienced several positive benefits from using it- with the largest being an increase in general energy. Since this FIR crystal mat does not include a cover, users have improvised by placing beach towels over the hard amethyst stones- this makes it much more comfortable to lay on. One buyer that we spoke to told us that, initially, he had been in the market for something that would be flexible enough to work on a couch recliner, but he quickly realized that this ion-therapy mat could really only be used laying it on the floor because of the stone stiffness. One buyer purchased the HealthyLine FIR pad because of its Jade crystals. They say that as a protective stone, Jade is reputed to keeps its users free from harm and delivers harmony. Jade crystals, he says, are reputed to attract good fortune and companionship, helping to stabilize the personality and encourage self-sufficiency. Its proponents say that it can help to soothe the mind, liberating you from negative thoughts while stimulating ideas. Crystal-healing practitioners also describe it as a dream stone, saying that it can help produce insightful dreams. It can also help to encourage release of negative emotions, especially of irritability. Another HealthyLine option is the Jade and Tourmaline mat. The manufacturers say that it is an FDA registered mat that is run through a 7-step quality control process and includes a one-year replacement on the mat itself. Buyers who purchased it have told us that they have experienced decreased joint pain as well as increases in sleep quality. If you are in the market for one of these infrared, crystal-healing mats, you should know that there is not a great deal of empirical research that has been conducted concerning their efficacy. Always consult with your physician prior to using a negative-ion mat to treat any illness or disease that you have.